The Schools’ Folklore Scheme, carried out in 1937 and 38, asked schools all over the Irish Free State to have students collect folklore in their homes and communities. The scheme resulted in a large collection of notebooks with handwritten accounts of local customs, stories, and history. Archivist Chriostóir Mac Cárthaigh explains that over 4,000 schools participated, resulting in over a million pages of writing. Schools’ Folklore Scheme (1937-38), filmed by Colm O’Flaherty. 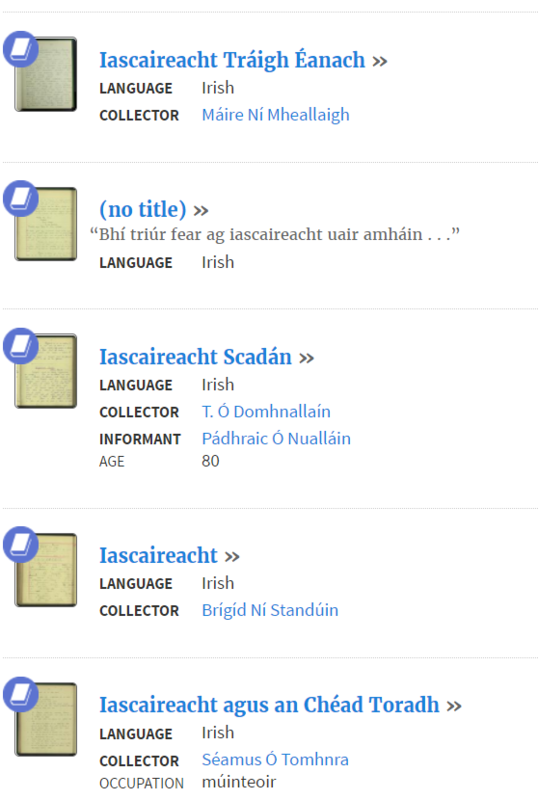 Cnuasach Bhéaloideas Éireann/National Folklore Collection. Published on YouTube by Dúchas.ie, January 2017. 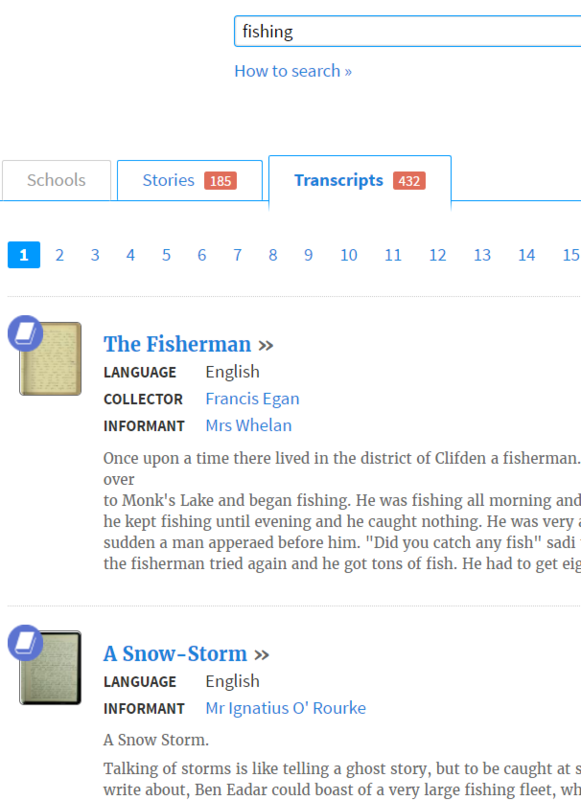 Now that the Schools Folklore Collection has been digitized, it is possible to search much of the collection online. Not only can the headings of digitized essays be searched, but as the essays are transcribed, keywords in the text can be searched as well. For example, I wondered about references to fishing, so I carried out two searches, one for “Fishing” and one for “Iascaireacht”, in order to find references in essays in both Irish and English. The snippet above is from the transcripts list from a search for “Fishing”. The snippet below is from the stories list from a search for “Iascaireacht”, the Irish word which means “Fishing”. Needless to say, the possibilities raised by this digital searching ability are very exciting. From scholarly use in folklore, anthropology or literary studies to general interest in a whole range of subjects. One of the reasons I continue to promote this database is that it might not occur to students who are working in literature, for example, that they might find useful and interesting material here. More information on this digital collection is available on the website of Dúchas.ie, including a bibliography and links to more information.